Jorgie Stanton-Watts, who died in 2016. A baby girl who died after a stay on Skylark ward at Kettering General Hospital 'would have survived' if vital medicine had not been stopped, according to a prominent endocrinologist. Jorgie Stanton-Watts, from Corby, was aged just 23 months when she died in 2016. County Hall, Northampton, where Jorgie's inquest has been taking place this week. Yesterday (Tuesday, April 2) the second day of an inquest into her death heard that had essential medication not been suddenly withdrawn from her after the first day of her stay, she may have lived. The little girl, who was born with no pituitary gland, had been admitted to KGH following a minor infection on Saturday, October 1, 2016. Because of her condition, she was more susceptible to infection. Taking the stand yesterday was Dr Richard Stanhope, who has forty years’ experience as a paediatric endocrinologist at Great Ormond Street, University College Hospital London and at the Portland Hospital. Dr Stanhope said that, on Jorgie’s admittance to hospital on the Saturday, staff had reacted correctly by administering intravenous hydrocortisone three times - at 6pm, midnight and 6am. He added: “That’s excellent treatment in the short term but in my youth it was called a steroid whitewash. “They perk you up, they make you feel much, much better even if you haven’t treated the underlying cause. But the hydrocortisone was stopped by medics after the first three doses. Dr Stanhope said that Jorgie should have had the full dose for four to five days before it was gradually decreased over the next four to five days. He said this information was in the British National Formulary - a copy of which was in every A&E department and every ward in every hospital. Medics had administered antibiotics after blood tests showed an infection. He said that Jorgie’s dehydration was exacerbated by antibiotics which caused diarrhoea. She’d had 10-12 dirty nappies per day before her death. She was suffering from negative fluid balance - where the amount of fluid in her body coming out was more than that going in. Jorgie was seen by medical staff to be ‘puffy’, which Dr Stanhope said was the beginning of the problems associated with metabolic acidosis - a condition that occurs when the body produces excess acid. He said that Jorgie’s pH reading (which measures acidity) had fallen to seven by October 5. “That’s getting close to survivability,” he said. When asked what difference the administering of hydrocortisone for five days would have made, Dr Stanhope said: “It’s impossible to say that even with optimal cortisol replication and fluid balance that Jorgie would not have died from septicaemia. “On the balance of probability, yes,” replied Dr Stanhope. He said that Jorgie was not in the group that die of this condition in childhood. “She had a minor thirst problem and she was getting over the worst,” he said. “The first two to three years are the most difficult because the fluid balances are more precarious. A second expert witness, paediatric endocrinologist Jeremy Kirk of the Birmingham Children’s Hospital said that he believed Jorgie’s cause of death was multiple organ failure caused by hypovolaemic dehydration and sepsis. He said: “The decision to stop hydrocortisone was inappropriate. He said that Jorgie hadn’t been weighed during her stay which would have helped doctors. Jorgie’s negative fluid balance was caused by excess fluid loss through nappies. He said the loss was ‘significant’ to someone of Jorgie’s weight. The corner asked Dr Kirk if there had been intervention on the fluid before 7pm on October 5, could they have been prevented Jorgie’s deterioration. Earlier yesterday, two nurses that treated Jorgie gave evidence to the inquest. Nurse Afua Ntumy, who cared for Jorgie on the night of October 4 through to the morning of October 5 said that Jorgie’s grandma had said that the baby was not herself. 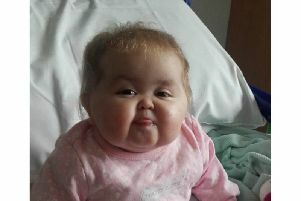 She said she was hungry and had needed a feed but doctors had instructed staff to restrict feeds because Jorgie was puffy. She said that Jorgie’s blood pressure was not taken because she was restless and it wouldn’t be accurate. Talking about Paediatric Early Warning System (Pews) Scores, which nursing staff were reliant on during Jorgie’s stay in KGH, coroner Philip Barlow said that Jorgie’s Pews score had reached eight in the early hours of October 5, asking Nurse Ntumy: “How can you measure the total Pews score if one if the readings, in this case blood pressure, isn’t done? At that level, an escalation plan was put in place and Jorgie’s observations should have been increased to hourly. This was not done. But she added that Jorgie had seemed well until hours before her deterioration, being pushed around the ward by her grandmother who was with her at the time. The court also heard that written recordings of observations were not always made at the times they were taken, and that nappies were not weighed immediately, instead being weighed in batches later on. Nurse Tanya Ball, deputy sister on Skylark ward with 18 years’ experience, was on the 7am to 7.30pm shift on October 5. She was the nurse in charge. “We were short-staffed,” she said. “And we had a few patients who were high demand. She said that blood tests would have been done early in the day had they been ordered by doctors, but they had not been. “I became aware around lunchtime that a blood test had to be taken for Jorgie. “One of the doctors told me. I asked if it was OK if I did it at 6pm when I did her antibiotics.” Nurse Ball was told this was OK.
She was not told to mark the bloods as urgent. She said that nappies from 2pm, 4pm and 7pm had all been weighed at once. She said this was ‘not appropriate.’ She admitted that observations had not been done hourly during the day. She said that Jorgie had been ‘happy and cheerful’ during the day but by the time her shift finished at 7pm, Jorgie was grizzly, but that could have been because it was bedtime.